Economics is the study of how resources are produced, allocated, and consumed by society in order to meet the needs of individuals or groups and satisfy human wants. 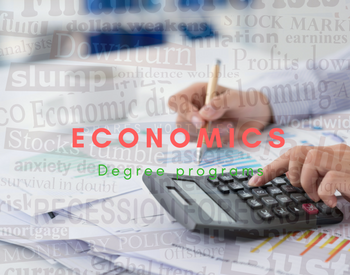 A degree in Economics equips you with an array of specialized analytical skills that you can apply in various industries, according to your interests. The skills you will acquire during your degree program are highly sought-after and will set you up for an exciting career in business, finance, government, or academia. Undergraduate Studies: B.A. verses B.S. Your career in economics begins at university, where you will complete your undergraduate degree. Depending on where you attend school, you may have the option to choose whether you will pursue a Bachelor of Arts (B.A.) or Bachelor of Science (B.S.) in Economics. The two programs will differ in their admission and graduation requirements. Which one you choose depends on your personal interests, abilities, and ultimate career goals. For students who are interested in using their qualitative analytical skills to explain social phenomena, or applying their understanding of economics to solve challenging public policy issues, then a B.A. program is a good fit. However, if developing strong quantitative mathematical skills is a more thrilling prospect, then you will be happier in a B.S. program that requires higher-level math and science courses. It is also important to consider your long-term educational and career goals when deciding whether to pursue a B.A. or B.S. Economics degree. For most students, entering the workforce after completing a four-year degree is sufficient for achieving their goals. Others may use their undergraduate studies as a springboard into a graduate economics program or professional degree such as law (J.D.) or business administration (M.B.A.). If you intend to pursue additional education, it is advised that you earn a B.S. so that you will have completed any prerequisites required by your graduate program. Graduate Studies: M.A. in Economics versus M.B.A.
Often, people are unfamiliar with the difference between a degree in economics and a degree in business. Aren’t they the same thing? Well, no. Economics studies the consumption of goods, while a business degree studies the efficiency of consumption; economics majors study the behavior of individuals in a market, while business majors study the behavior of businesses in a market. The two degrees are very complementary, and some of the skills and knowledge you learn in an undergraduate economics program will translate into an M.B.A. program quite nicely. Ultimately, though, the decision rests on your long-term career goals. If you wish to enter into the corporate world, an M.B.A. is the right choice. But, if you desire to be a professional economist - or a professor of economics - then you must complete a Master’s degree in preparation for doctoral studies (Ph.D.). For individuals who are passionate about furthering the field of economics, then the next step in their personal and professional development is to attend a doctoral program. If you are successful in completing your Ph.D., you will have access to unique opportunities for applying your depth of knowledge and skill. Many individuals, upon completing their Ph.D., stay in academia and continue to build their teaching and research portfolio. Others seek out highly specialized opportunities in government, finance, international relations, or public policy. As a professional economist, you will be responsible for researching and analyzing economics data and trends on behalf of a corporation, government, or multi-national organization. These highly-specialized careers require that you have completed at least a Master’s degree. Other personal strengths and skills required for this career include strong communication skills, the ability to work well with a team, and the confidence to demonstrate leadership on issues concerning policy and/or business strategy. Actuaries are business professionals who study the financial impact of risk on behalf of an individual or business. They rely on their understanding of mathematics, statistics, historical data, and behavior to evaluate the likelihood of a particular event and the inherent risk. Most actuaries are employed by insurance companies. Others work with pension funds and investment firms, or work as consultants for various businesses. In addition to completing a four-year bachelor degree in economics, actuaries must be professionally certified by either the Society of Actuaries (SOA) or the Casualty Actuarial Society (CAS), which requires applicants to take several exams and attend professional seminars. Completing professional certification takes four to six years to complete. Investment analysts provide stockbrokers, fund managers, and stock traders with financial information and recommendations based on data, trends, and quantitative models. While fund managers are responsible for making decisions about investments, it is the investment analyst who is responsible for synthesize information from multiple sources in order to equip the fund managers to make informed, reasonable decisions. Working as an investment analyst requires a high degree of personal responsibility and a willingness to work long, stressful hours. But reliable, well-respected analysts are rewarded with good promotion opportunities and impressive financial incentives. Now is a fantastic time to prepare for a career in economics. According to the Bureau of Labor Statistics, the median annual wage for economists was $102,490 in May 2017. It is expected that available jobs for economists will increase by 6% over the next decade - with most jobs requiring a master’s degree or Ph.D., strong analytical skills, and experience using statistical modeling software. The study of Economics is divided into two parts - Macroeconomics and Microeconomics. Microeconomics include analyzing the economic decisions that are made at a micro level, like the effect on the purchase decision of a family by the increase or decrease in a product's price. Macroeconomics, on the other hand, includes the total decisions that are made by people in society, like, how does any change in the rate of interest influences the national savings? The Department of Economics at the famous Harvard University is one of the top schools/educational institutions in the country to pursue a degree in the subject. Harvard offers undergraduate, graduate and Ph.D. Program course in Economics. The student should have done a prior research or have a prior experience having worked as a research assistant. If it's the latter case, then a letter from a supervisor stating the capability to perform the research would be critical. The minimum mathematical preparation level of to be taken into consideration includes linear algebra, calculus as well as proving your mathematics proficiency. Most of the successful applicants, in particular, take up real analysis now, although that isn't a big requirement. The average score of the GRE test taken among students that have been admitted to the University in the past few years has been 797. All those applicants whose first language isn't English, and all those who haven't gotten their bachelor's degree from an educational institution with English as their first language, ought to meet TOEFL's - Test of English as a Foreign Language, minimum score requirements. The Economic students at this University receive stipend support and full tuition while they are admitted and heading towards a satisfactory progress in getting their degree. The Economics Division here urges the applicants strongly to apply for financial support from the extramural agencies. Pupils, who get extramural fellowships, which are competitively funded, might be eligible to get an educational allowance. In case you have already applied for external funding, then you are to mention that in the application. In case an applicant does not have to fund while apply but can source it later, then they ought to ensure that they communicate the same to the department. The tuition fee for full-time students for the students of Economics at the University's Economics Department, for a year, is about $35,000 apart from other various expenditures. Admission and financial aid decisions are made by the Admissions Committee of the Department in February of each year for the class which will enter the following September. The Department receives more than 700 applications per year, and about 50 are admitted. The entering class size usually consists of 25 students. The Department does not defer admission; applicants must begin their studies in September of the year in which they are accepted. Each year the department receives over 800 hundred applications for admission. The program is very competitive, enrolling only twenty-five new students each year. Students are required to take the Graduate Record Exam. The average score on each section of the GRE is 780 - 800. The department is particularly interested in the Quantitative score. Students who are non-English speakers, and who have not attended a U.S. College or University, are required to take the TOEFL Exam. Working knowledge of multivariate calculus and matrix algebra required. To qualify for a visa, all international students must submit a Financial Statement to the Graduate School, showing that they have sufficient funds available to support themselves for the duration of the program (four years). The amount required for the academic year 2003-04, exclusive of travel to Madison but inclusive of tuition and living expenses, is $35,000 (Age 25 and under) $35,188 (Age 26 and over). Master's Program Students should have first-year calculus, a course in statistics, and some background in economics before beginning course work. Students who do not meet these requirements may still be admitted but normally must take these courses as prerequisites to the required courses. Applicants to the M.A. program are expected to have the same academic potential as Ph.D. applicants, as reflected by GPA and GRE scores. Admission to the M.A. program does not guarantee later admission to the Ph.D. program. MBA or MS or Economics?